PEPPY® enters the american market! Dear needlewomen! We are glad to announce, that PEPPY® TM has overstepped the Atlantic and now participates in the biggest international exhibition CHA Mega show together with other world-known companies! CHA Mega show (Hobby craft show) is held once a year in the USA and is a unique event, which unites the major art and craft companies from all over the world for business. In 2015, companies from 55 countries took part in the exhibition – it is more than 400 manufacturers and more than 12 000 new products! 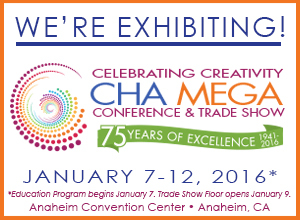 CHA Mega show celebrates its 75th anniversary in 2016. The exhibition is held on January 7-12, in the USA (Anaheim, California) in the Anaheim Convention Center. PEPPY® will show its new product – craft sets for children in a brand new unique «Patchwork applique» technique. PEPPY® will also participate in “Best Product 2016” awards (CHA Hot Product Awards), held at the exhibition, where companies compete with each other in innovations, design know-hows, consumer functionality of their products and etc. The winner will be selected by the jury of the exhibition. We will be glad to see you at our booth: Hall A, booth No. 2546. Wish us luck! And keep up with our news!